Will the Earth Have Two Suns by 2012? It's a good thing comets don't hold a grudge. If they did, comet Tempel 1 would have a few choice words for NASA when the agency's next spacecraft comes calling. That encounter is set for Valentine's Day and should be a peaceable affair, as the Stardust spacecraft whizzes within 124 miles (200 km) of the ancient ball of rock and ice and snaps some six dozen pictures before vanishing back into the void. The last time a spacecraft buzzed the comet, however, was in 2005, and on that mission, the Deep Impact spacecraft used Tempel 1 for target practice, firing an 820-lb. (370 kg) copper projectile into its flank, blasting out a massive plume of debris and vapor that the spacecraft could then analyze. The return trip by a different ship will be not only a scientific achievement but a clever administrative one, demonstrating NASA's increasing ability to find multiple uses for its robot probes, flying two or more missions for the price of one. Unmanned spacecraft have historically been throwaway machines, mostly because it would be pointless to build them any other way. Once you've flung a ship into space, its entire job is to send back pictures and data for as long as its fuel and power hold out. When it's finished with that work, there's simply no use for the metal hulk that remains. The problem is, those hulks cost a lot of coin. Probes like the old Viking landers or the lost Mars Observer  which vanished from the skies in 1993 before it ever reached its destination  could go for a cool billion each. Even the newer, stripped-down ships the space agency builds these days still cost hundreds of millions each. For that reason, NASA has long found itself under pressure to squeeze as much use as possible from its Cadillac machines, and it's been during recent explorations of comets that the agency has achieved that goal most ingeniously. 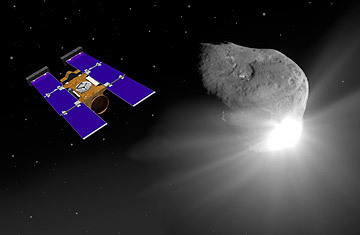 Deep Impact was launched in December 2005 and reached Tempel 1 that July, firing its cosmic cannonball into the comet's nucleus. When its encounter was done, however, the ship was still flight-worthy and NASA engineers thus decided to retarget it for a 2008 flyby of comet Boethin. Two years and millions of flight miles later, however, Boethin was nowhere to be found  apparently having disintegrated. Mission planners thus steered Deep Impact in yet another direction, aiming it for comet Hartley 2, which it reached  and gloriously photographed  last November. Next on the list for a second-act mission was Stardust. In 2004, the ship flew through the tail of comet Wild 2 and collected dust particles that it stored in a small re-entry pod. Swinging by Earth two years later, it released the pod, which plunged through the atmosphere and landed by parachute in the Utah desert. Like Deep Impact, though, Stardust was still fit to fly and was thus repurposed for a mission to Tempel 1. It's taken four years and eight course corrections to steer the ship for an on-time arrival on Feb. 14 at the comet that is 3.7 miles (6 km) wide  a sand grain of a target in the enormousness of the solar system. At least three more trajectory tweaks will be needed before the final rendezvous next month, by which point the ship will have been in space for nearly 12 years, circled the sun four times and traveled nearly 3.7 billion miles (6 billion km). "You could say our spacecraft is a seasoned veteran of cometary campaigns," says Tim Larson, a NASA project manager. "It's been halfway to Jupiter ... collected cometary material for return to Earth and then headed back out into the void again." When the ship at last reaches Tempel 1, astronomers will once again be trying to gather data on the comet's composition and will be particularly interested in getting a glimpse of the crater the Deep Impact ship produced with its heavy impactor. The size of the pit will reveal more information about the density of the comet's nucleus and perhaps even provide a peek at its innards. "Going back to Tempel 1 will provide new insights on how comets work and how they were put together 4.5 billion years ago," said Joe Veverka, a professor of astronomy at Cornell University and the mission's principal investigator. The return trip will serve some terrestrial purposes as well. NASA funding is always an uncertain thing, never more so than in times of economic hardship, when matters otherworldly can seem like a budgetary luxury. Demonstrating that it can still build world-class machines and fly them in innovative ways does not hurt the agency's rep. What's more, if federal funds stay flat or decline, extending the lives of existing ships until they simply drop dead from exhaustion may be the best way to get good science done on the cheap. That end state will come soon for Stardust. Its fuel mostly spent after its upcoming flyby, it will be given little more work to do before it eventually winks out. The data it returns, however, will be studied long after the ship is gone.